The difference between type 21 and type 22 radiators is important to know to ensure you're buying the correct heater to heat your room properly and efficiently. Posted By Alan, 2nd Aug 2018. 5 Minute Read. Whether you're looking to add warmth, style or a bit of both to your home then a radiator is the first thing most people will think of. Whatever room you're looking to furnish be it a kitchen, living room or even a bathroom there's a wide variety to choose from; one of which is a convector radiator. If you’re planning to buy a convector radiator then you’ve probably come across the terms Type 21 and Type 22 - and maybe even Type 11 and Type 33. Unless you’ve bought this type of radiator before, or you’re a heating engineer, then you’re probably wondering what the difference is between them. If you’re deciding between Type 21 (also known as P+) and Type 22 (also referred to as K2) convector radiators, and unsure which one you should buy, then read on to find our simplified explanation of the difference between them and which one you need. Before we look at the difference between Type 21 and Type 22 radiators it’s ideal to know exactly what convector radiators are. 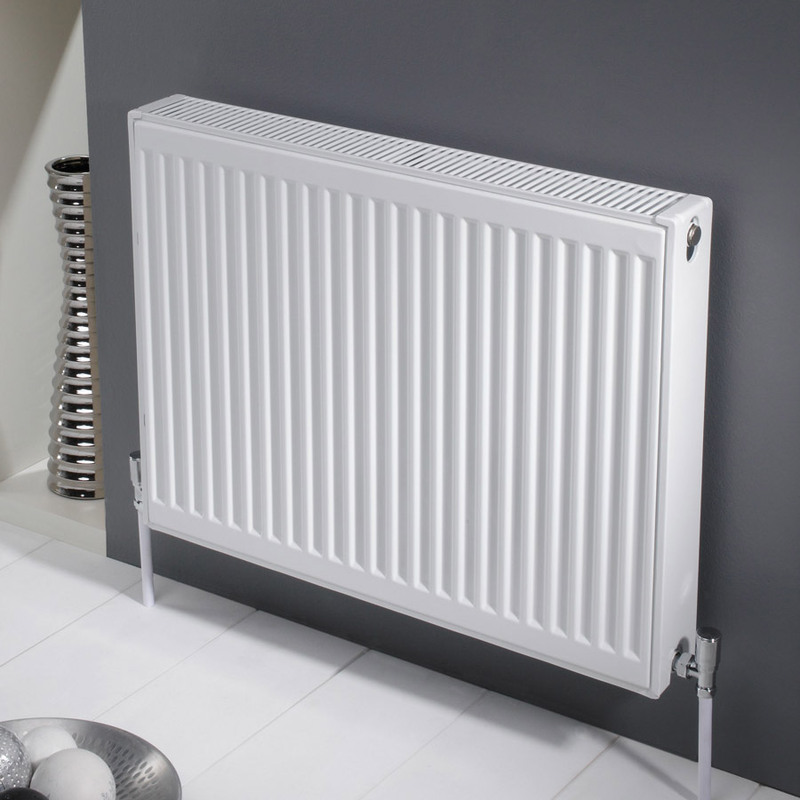 What is a convector radiator? A convector radiator heats the room by way of convection. Rather than relying solely on pipes or tubes like other radiators, which are heated with water or oil, convector radiators heat up rows of fins which are arranged in a variety of ways inside the radiator. This row of fins heats the body of air within the radiator and allows it to escape through vents, usually found at the top of the radiator itself. 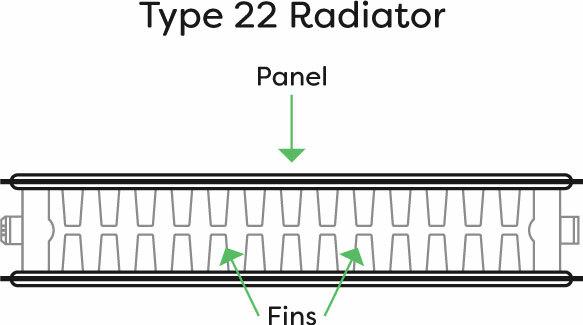 The main difference between Type 21 and Type 22 radiators is the layers of fins, also known as the number of convectors. Type 21 convector radiators feature 2 panels which encase a single layer of fins. An easy way to remember the numbering system is the first number represents panels and the second number represents fins. 2 panels and 1 layer of fins is Type 21. Type 22, by using the same logic would mean 2 panels and 2 layers of fins. To help remember this further it is best to say 'type two, one' rather than 'type twenty one' and 'type two, two' rather than 'type twenty two'. As you can imagine more is always better so Type 22 radiators typically generate much more heat than Type 21 radiators. This is down to the additional layer of fins inside. Below is a drawing to show you the 2 rows of fins bounded between the two panels of a type 22 radiator. More fins inside means there's more space required to store them. 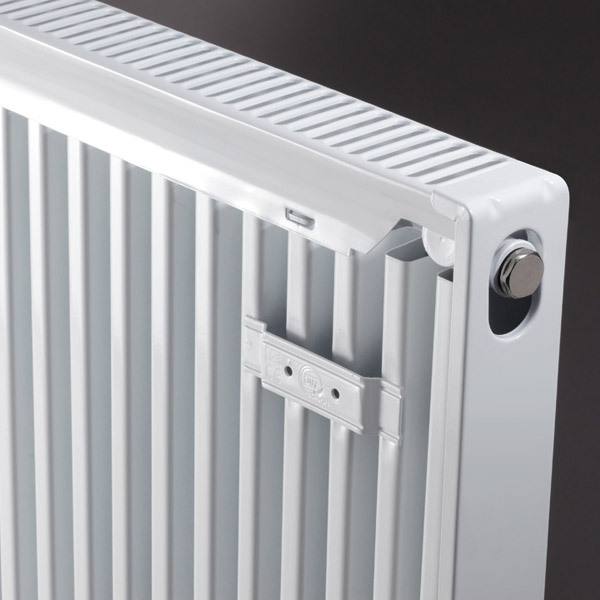 A Type 22 radiator is therefore generally wider than a Type 21 radiator. A typical Type 21 radiator will have a depth of about 70mm whereas similar designed Type 22 radiators will be around 100mm. There are other types of convector radiators around which are less common than Type 21 and 22, these are Type 11 (also referred to as K1) and Type 33 radiators. 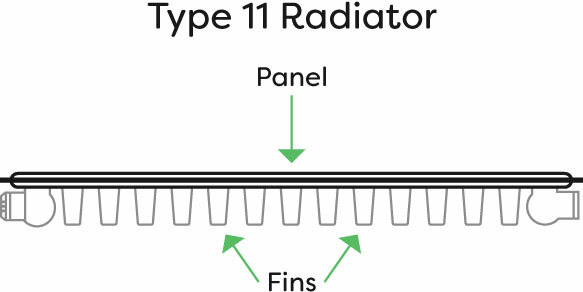 Type 11 is a single panel radiator with a single layer of fins. It's looks very similar to Type 21 convector radiators but has no back panel which is usually hidden from sight. 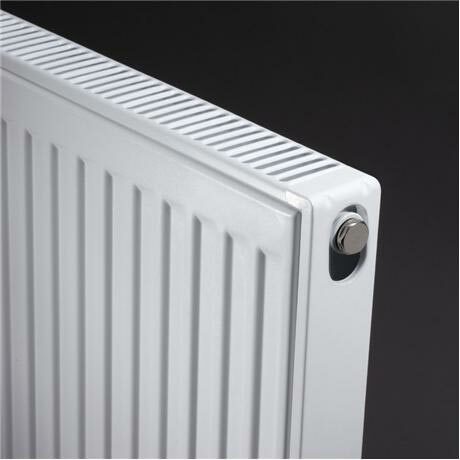 Type 33 convector radiators combine a Type 22 radiator and a Type 11 radiator to create the ultimate in heat output. 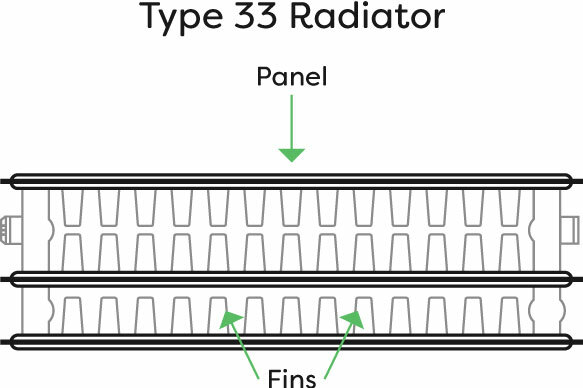 Type 33 radiators have 3 panels encasing 3 layers of fins. Below is a drawing to show you the 3 rows of fins bounded between the three panels of a type 33 radiator. Now you know the difference between Type 21 and Type 22 radiators it should make buying the right one simple. Why choose a Type 21 radiator? A Type 21 convector radiator is ideal for smaller spaces. With a reduced depth it means that you can still get excellent heat output, but without sacrificing too much space. If space is very tight and heat output isn’t a huge factor then you could consider a Type 11 radiator which is even slimmer. Look out for compact convector radiators if you want to make the most of small spaces. A vertical convector radiator can be installed on a narrow wall which may otherwise be unused space. Why choose a Type 22 radiator? A Type 22 radiator is the perfect choice if you have ample space and where higher heat output is essential. The increased depth of these convector radiators can feel a little bulky in smaller rooms. If heat output is your main focus and your room is big enough then why not take a look at Type 33 radiators which generate the highest heat output of all the options mentioned. We really hope you’ve found this simplified guide on the difference between type 21 and type 22 radiators helpful. If you do have any comments then please get in touch or leave a comment. If you think others may find this information helpful then please feel free to share it via email or social media by using the sharing buttons below. 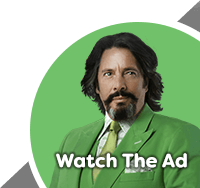 What's Your Budget? The WYB team takes you on a lavish tour of luxury bathroom radiators over £300.